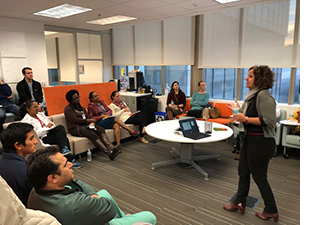 The Miami CTSI’s Connection for Research Career Enhancement held its second meeting on Wednesday, November 28, and featured Co-Director of Miami CTSI’s Institutional Career Development Core, Alessia Fornoni, M.D., Ph.D. The talk led to an energized discussion of scientific innovation and entrepreneurship, decisions that help one get promoted, and the pros and cons of choosing a career in academia, private practice, or industry. Dr. Fornoni, a remarkable scientific leader at UM, shared a most personal account of her accelerated journey up the ranks of academia as she balanced work and family obligations. The Connection’s next meeting is planned for early January, 2019.